Looking good has never been so convenient! Are you ready to experience the Vitamin-IV drip treatment which has been revolutionizing the field of Holistic Medicine & preventative healthcare? Quest’s menu of Vitamin-IV Hydration treatments are specially formulated to address your specific health needs by restoring optimal vitamin & mineral levels within the body. There are numerous benefits to getting regular Hydration treatments including increased vitality, a stronger immune system, & enhanced sense of wellbeing. All IV’s are prescribed & administered by qualified Medical professionals in Quest Center’s relaxing & luxurious lounge environment. Who benefits from Vitamin-IV Therapy? Everyone can benefit from IV-nutrition in some way. The rapid pace of modern American life has led to many people struggling with debilitating stress, lack of sleep, low energy levels, depression, etc. If you need further direction on which IV option is best for your symptoms, you can schedule a consultation with a member of Quest’s Medical Team or determine your body’s exact needs via Quest’s Functional Testing Program. By receiving vitamins & minerals in ‘IV’ form the body is able to absorb a much higher concentration of nutrients directly into the bloodstream. This enables the vitamins, minerals, & amino acids to replenish cells at a rate 50-100 times higher than administering vitamins through Oral supplements, & even returns notably higher nutrient levels than intramuscular(IM) booster injections. Patient’s with weakened immune systems or seasonal illnesses have a harder time absorbing and holding nutrients within their cells, vitamin IV therapy floods these cells with adequate nutrition, returning them to a more healthy & natural state for a period of time. The enhancements in cellular nutrition help sick patients alleviate their symptoms & bounce back more quickly during recovery. 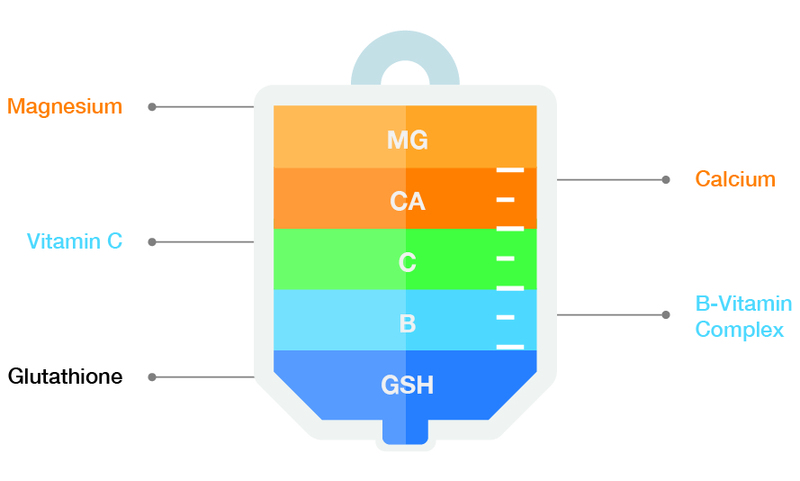 One of the most common Vitamin IV’s administered today, the mixture is named after John Myers, MD, who began using the therapy over 40 years ago. The basic formulation consists of: a B vitamin complex, calcium, vitamin c, magnesium, and sometimes additional ingredients are added by Physician’s recommendation or personal request. Glutathione is a powerful antioxidant which assists in the removal of free radicals from the body & plays a major role in the detoxification of the liver, kidneys, lungs, & intestines. Low Glutathione levels are associated with higher levels of free radicals & have been shown to play a factor in degenerative mental disorders such as Parkinson’s disease. Whether you feel like you’re coming down with cold/flu symptoms or are just feeling the after effects of a night out on the town, this is our best formula for illness & over-indulgence recovery. A blend of B Vitamins, Calcium, Vitamin C, Selenium, Magnesium, & Glutathione provide the extra ‘push’ you were needing to recover more quickly & feel your best! This concentrated dose of Vitamin C simultaneously provides a boost to your immune system, while also improving the overall health and appearance of the skin. Vitamin C also fights the absorption of free radicals within the body & provide a boost of cellular energy for improved mental clarity, focus, & emotional balance.